A key organizer for King’s SCLC, James Bevel was one of the principal architects of the Birmingham Children’s Crusade, which put hundreds of school kids in the streets in 1963. One way or another he was also involved in most all the major campaigns in the 1960s, including the Freedom Rides, usually recruiting volunteers and educating them in nonviolence, as he did in Jackson during the Rides. In an interview for Eyes on the Prize, Bevel talked about how responsive the children of Birmingham were to the idea of nonviolent direct action, much more so than adults. James DeVinney was a writer, director and producer of the series. The full, unedited transcript of the interview has recently been posted at the Civil Rights Movement Veterans website. James DeVinney: You talked about the indoctrination of adults. What was the adult thinking? James Bevel: In ’63 in Birmingham most adults felt that segregation was permanent. That it was just that way, a permanent system. People’s homes and churches had been bombed, people had been lynched and killed and there was no process by which you could gain redress to your grievances. The adults had a conditioning. As organizers you had to get people who had not experienced all of that and who had confidence in themselves and in our system of law. The young people in Birmingham were susceptible to the principle that the attitudes and opinions of white people did not constitute law. That that was simply tradition and custom and if we lived according to the New Testament and the Constitution, then we would forge a new law rather than having to live by the attitudes and opinions of the dominant people at that point. DeVinney: Tell me a story about what it was like when you started to train all those children. Bevel: I had come out of the Nashville movement and the Mississippi movement, where we had basically used young people all the time. And at first King didn’t want me to use young people in Birmingham, because I had 80 charges of contributing to the delinquency of a minor against me in Jackson, Mississippi, for sending young people on the Freedom Ride. 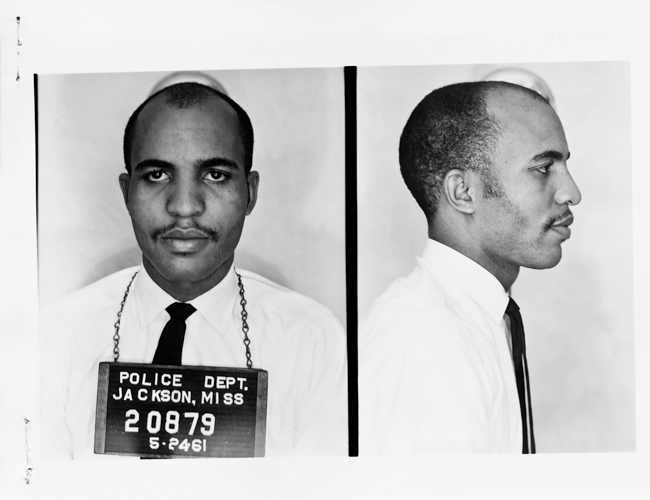 James Bevel rode on the first bus of Freedom Riders into Jackson in 1961. He quickly bailed out after his arrest and began recruiting local high school students to join the Rides. At that point that was about only five to ten, twelve adults who would go on demonstrations each day. My position was, you can’t get the dialogue you need with so few people. Besides, most adults have bills to pay, house notes, rents, car notes, utility bills. But the young people — they can think at the same level but are not, at this point, hooked with all those responsibilities. So a boy from high school, he get the same effect in terms of being in jail in terms of putting the pressure on the city as his father and yet he is not, there is no economic threat on the family because the father is still on the job. So the high school students was like our choice. We said to them you’re adults, but you’re still sort of living on your mamas and your daddies. It is your responsibility, in that you don’t have to pay the bills, to confront the segregation question. We went around and started organizing say like the queens of the high schools, the basketball stars, the football stars, so you get the influence and power leaders involved. And then they in turn got all the other students involved. . . .
DeVinney: You’re telling me a lot of the philosophy, but what happened when you brought these kids together. I know there’s a story in here somewhere. Bevel: First thing we did, there’s a film, The Nashville City and Story. It was an NBC White Paper. We would show that film in all of the schools. Then we would say to the students, you are responsible for segregation, you and your parents, because you have not stood up. Our position was that, according to the Bible and the Constitution, no one has the power to oppress you if you don’t cooperate. If you say you are oppressed, then you are also acknowledging that you are in league with the oppressor. Now it’s your responsibility to break league with the oppressor. If you don’t second his motion on what’s wrong, his motion on what’s wrong will die, and you make a motion in terms of what’s right, and second your motion, and that motion will become alive. As long as you go along with segregation, you second Bull Connor’s motion. Don’t second his motion. Put your own motion on the floor. Schools and business shouldn’t go on as usual as long as you’re involved in being oppressed. DeVinney: Tell me about the kids. How did they respond? Bevel: They responded beautifully. Your first response is from the young women. I guess, from about 13 to 18. They’re probably the more responsive in terms of courage, confidence and the ability to follow reasoning and logic. Nonviolence to them — it’s logical that you should love people, you shouldn’t violate people, you shouldn’t violate property. There’s a way to solve all problems without violating. Nonviolence is uncomfortable. It’s inconvenient. But if you maintain your position, the threat goes away. DeVinney: Who was the next group to respond? Bevel: Then the elementary students. They can comprehend. I guess the last guys to get involved was the high school guys. Because the brunt of the violence in the South was directed towards the young males. The females didn’t have the kind of immediate fear, say, of white policemen, as the young men did. So their involvement was more spontaneous. DeVinney: I don’t want to philosophize about this too much. I want something visual, if you can describe how the kids responded or behaved. Can you do that? Devinney: OK, OK, but you’re giving me philosophy again. I want to know what the kids did. How does a 6-year-old girl respond in the midst of something like the Birmingham events? Bevel: Children are children. They act like young people act, and they didn’t always go around acting like, you know, monks. She goes to Sunday School and she lives out her conviction. My position was, well, if you understand what the cross is about and you don’t have no problem with getting killed, and you don’t have no problem going to jail, and you understand that you can’t sue nobody, ’cause this is something you take upon yourself. If that’s the way you feel, if you feel about it like I do, then you can get involved. And it was on that basis that that young girl was involved.